Enjoy an incredible 5,000 BTUs of warmth that comfortably heats up to 400 sq. ft. from Napoleon's Allure Phantom 42-inch Electric Fireplace. Enjoy the luxury of a fireplace without the need of specialized installation. Just hang, plug, and enjoy. The matte surround and mesh front provide an entirely unobstructed view of the glass ember bed and multicoloured flames, without the glare from a glass front. A touch of a button alternates between a combination of flame colours to set the perfect mood. At only 5 inch deep, this fireplace won't intrude on your living space, and can be fully recessed. Make a huge impact in any room with the Napoleon Allure Phantom 42 Electric Fireplace. Instantly retrofit your existing fireplace by adding both flame effect and heat with this Pleasant Hearth Electric Insert. Energy efficient LED technology powers this log set, and it's easily installed by plugging into any 120 Volt outlet. Add instant ambience to your fireplace and heat a room up to 400 sq.ft. at the same time. Remote control included. For the connoisseur, make the investment that lasts a lifetime. The Historic Mantels King Henry Cast Stone Mantel brings home a time when elegance and exquisite detail were the standard. Beautiful carved design. A substantial presence in a medium or large family room, dining or living room. Affordable luxury-enjoy the look of a custom designed mantel without designer prices. This cast stone mantel can be used around electric, gas or log burning fireplace inserts. The Chateau Series of mantels includes a 3-piece hearth in matching stone. Use the included matching filler panels or create your own original custom surround. Easy to install; a 2-person do-it-yourself project. All parts and full instructions included. Exquisite sculpted design rests on architecturally inspired bases. The Historic Mantels Designer Series Michael Angelo Cast Stone Mantel adds warm and inviting elegance to your home. This Designer series mantel fits into smaller spaces beautifully, including smaller homes, townhouses, condominiums, apartments and home offices. Lean back and enjoy the warmth and crackling flames, whether they are electric, gas or burning logs. Affordable luxury -- enjoy the look of a custom designed mantel without designer prices. Matching filler panels are included. Use them for a seamless look, or create your own original custom surround with materials of your choice. Easy to install; a 2-person do-it-yourself project. All parts and full instructions included. Luxurious classic detailing strikes a contemporary note. The Historic Mantels Designer Series Paris Cast Stone Mantel will add a touch of elegance to both traditional or modern rooms. This cast stone mantel fits into smaller spaces beautifully-smaller homes, townhouses, condominiums, apartments and home offices. Lean back and enjoy the warmth and crackling flames--whether they are electric, gas or burning logs. Bring affordable luxury into your space-enjoy the look of a custom designed mantel without designer prices. Matching filler panels are included--use them for a seamless look or create your own original custom surround with materials of your choice. Easy to install; a 2-person do-it-yourself project. All parts and full instructions included. 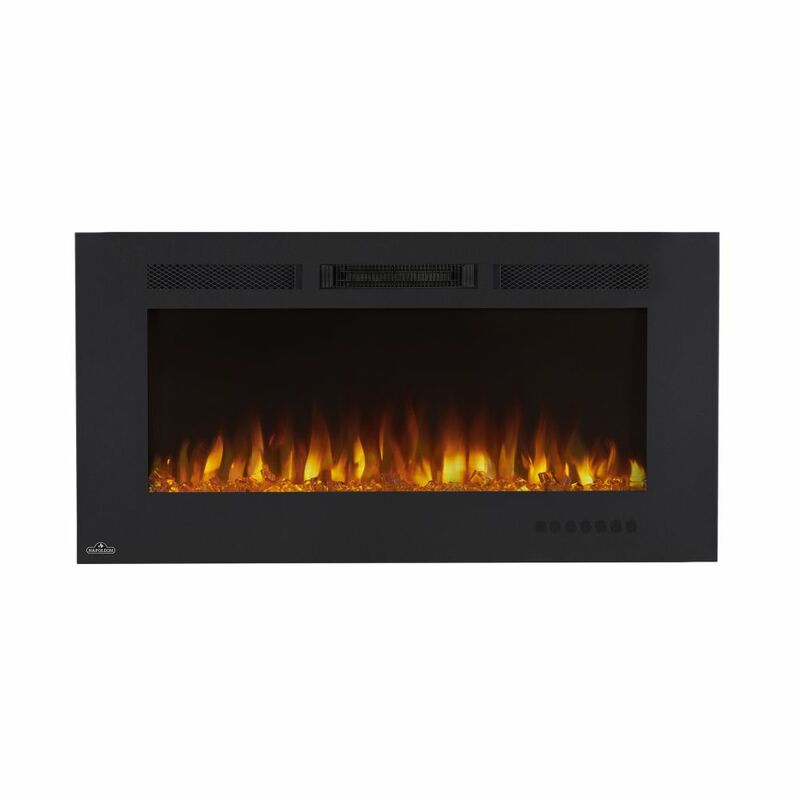 Allure Phantom 42-inch Wall Mount Electric Fireplace with Non-Reflective Mesh Screen Enjoy an incredible 5,000 BTUs of warmth that comfortably heats up to 400 sq. ft. from Napoleon's Allure Phantom 42-inch Electric Fireplace. Enjoy the luxury of a fireplace without the need of specialized installation. Just hang, plug, and enjoy. The matte surround and mesh front provide an entirely unobstructed view of the glass ember bed and multicoloured flames, without the glare from a glass front. A touch of a button alternates between a combination of flame colours to set the perfect mood. At only 5 inch deep, this fireplace won't intrude on your living space, and can be fully recessed. Make a huge impact in any room with the Napoleon Allure Phantom 42 Electric Fireplace.